The A83 Rest and Be Thankful in Argyll remains closed and it will be assessed at 11:00 on Friday morning, engineers have said. The road was closed on Wednesday after between 30 and 50 tonnes of material slipped down the hillside, but did not reach the road. 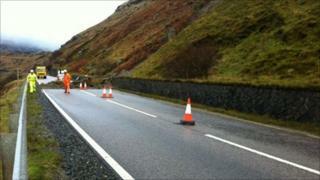 It is the fourth time in five years that a landslip has caused the route to close. The closure has left motorists facing a 26-mile diversion. Northbound traffic is being diverted via the A82 at Tarbet onto the A85 at Tyndrum, before joining the A819 at Dalmally and then returning to the A82 at Inveraray. The southbound diversion is the reverse of this route. A spokesman for Transport Scotland said the Met Office had confirmed that 54mm of rain had fallen near Tyndrum in 24 hours. The spokesman said: "Following a period of very heavy rainfall, TranServ engineers have reported that a slip has occurred further up the hillside and that approximately 30 to 50 tonnes of material has slipped, but not reached the road. "We are working with Argyll and Bute Council, the police and other parties to ensure a co-ordinated response to this incident." Equipment has been put on standby to clear any debris that does land on the road. The route has been blocked by landslips in 2007, 2009 and again last year. Earlier this month, Transport Minister Keith Brown announced a further £1m would be spent on helping to deal with future landslips in the area. This was in addition to a recently commissioned study which is investigating the feasibility of longer-term options.